Six Flags Great Adventure add heavier supports to Kingda Ka. Six Flags Great Adventure is getting prepared for their new drop ride which will be attached to the Kingda Ka roller coaster. While causing the death of Rolling Thunder, Zumanjaro is moving along in progress. 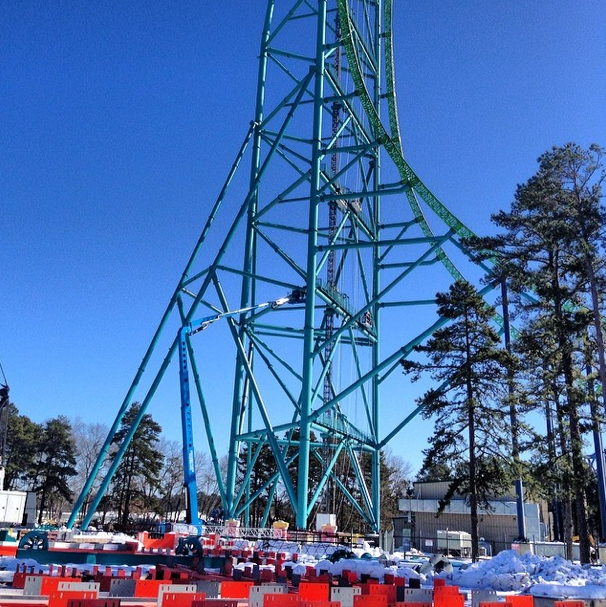 This new drop ride is causing Six Flags to adding some heavier, additional supports to the Kingda Ka tower track. While these types of roller coasters are often plagued by wind speed closures perhaps these new supports will add in keeping both Kingda Ka and Zumanjaro open longer in the future. Zumanjaro will have a total of three drop tracks running the length of the Kingda Ka tower. In the image you can see the track for Zumanjaro and it appears ready to go into place.